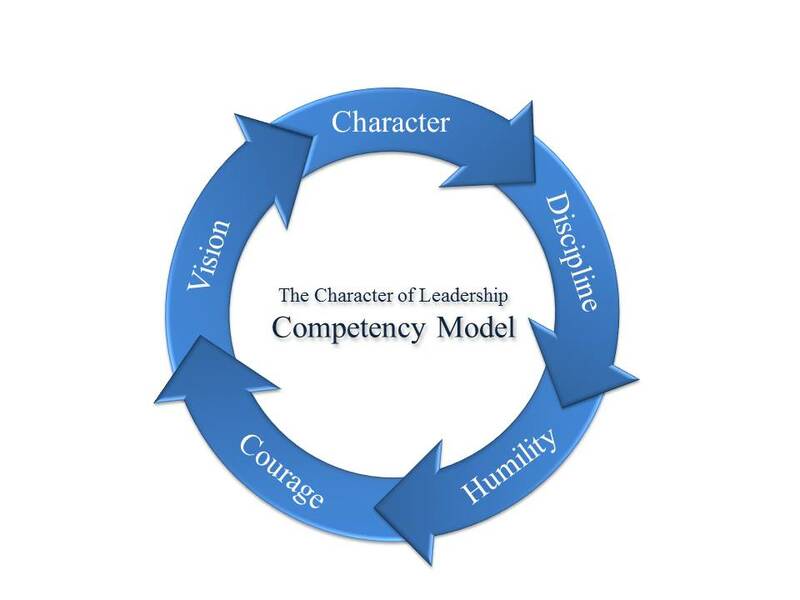 The Character of Leadership Competency Model was developed through years of personal experience. It was influenced by the thoughts and ideas from a multitude of sources, and shaped by real world application in my role as a leader, influencer, and developer of people. I believe that the foundation of superior leadership is comprised of 5 essential core attributes – Character, Discipline, Humility, Courage, and Vision. Naturally, there are also many essential behaviors that leaders must demonstrate. Good communication is most often noted as an obvious example. I certainly agree, however, this model is not intended to be a list of behaviors or habits. It’s far more a reflection of the values and belief system that superior leaders model in their both their personal and professional lives. These attributes represent the broadest measure of a leader’s effectiveness and success. Trustworthy – Trust is a product of character and integrity, and is the foundation for effective leadership. Speaks with Authority – Leaders speak not out of arrogance (from a perspective of position or title, i.e., ego), but with unwavering conviction and confidence in their vision (truth). Integrity Above Reproach – Effective leaders must have credibility. This is built on honesty, steadfast principles and standards. Good leadership is a matter of character, and character is defined by integrity. Resilient – While having many weaknesses and limitations, leaders must be strong and stalwart. Empathetic – Essential to compassion, sensitivity, and understanding – leaders must give people room to fail as well as succeed. People need encouragement and reinforcement when they struggle. That’s why we coach. Never Compromises Absolutes – It is one thing to compromise on matters of preference, it is quite another to compromise on matters of principle. Definite and Decisive – Good leaders must be able to make decisions that are clear-headed, informed, and conclusive. The must also communicate objectives in a way that is articulate and specific. Knows How to Delegate – You simply cannot, and should not, do everything yourself. A few things demand hands-on attention – delegate the rest. Remember what it is you are working for. Self-Disciplined – Discipline ensures we operate by principle rather than emotion or personal desire. Humble – Good leaders are humble with a willingness to serve others first – employees, customers, and company. Competent leaders do not need to seek the spotlight of recognition. Their success is defined not by being indispensable to the organization, but by leading others to lead themselves. The most effective leader is one who makes his own presence unnecessary. Knows His Limitations – A leader who forgets his own weaknesses will inevitably fail. Knows When to Change His Mind – Good leaders are definite and decisive, but not inflexible. They do not perpetuate bad decisions (out of ego) and know when to adapt to changing circumstances. Admits Mistakes – Character and trust is strengthened when leaders admit and take ownership of mistakes. Does Not Abuse Authority – Having authority does not mean being authoritative. Takes Initiative – Acting in the best interest of others, regardless of position or authority. Doesn’t Run in Face of Opposition – Good leaders do not abdicate their role when challenged. They are steadfast and firm – demonstrating authority and grace under pressure. Courageous – People do not follow cowards. Character is tested under fire and leaders must demonstrate courage. Sets a Personal Example – Empowers others through personal actions and integrity – walking the talk. Strengthens Others – A leader’s purpose is to make everyone around him better – stronger, more effective, more motivated. Optimistic and Enthusiastic – Optimistic enthusiasm inspires people. Employees will naturally follow a leader who arouses their hopes, and they will just as surely reject anyone who is perpetually pessimistic. Focuses on Objectives – A leader focuses on objectives, not obstacles. Passionate – A strong leader cannot be detached or indifferent. He must be passionate and purposeful. Energetic – Have you ever known an effective leader who was lazy? Leaders must be industrious and enthusiastic. The third attribute demonstrated by superior leaders is often the most elusive and under-appreciated. The very concept of humility rarely crosses the mind of most people in positions of authority. It is simply not how we are typically conditioned to think. Our culture champions the loud, the bold, and the brazen. I stated early on that we live in a self-centric society. It’s the “me” generation – self-absorbed, self-centered, self-inflated, narcissistic, entitled, demanding instant gratification, and lacking any sense of personal responsibility. This is the age of entitlement. At the risk of sounding like somebody’s grandfather, today’s generation is vapid and superficial, placing more value on appearance than character. Contrary to the view of leadership that many managers maintain, leaders are servants, and superior leaders have a heart for service. But servitude in this context does not mean that leaders are subservient – they don’t wait on people, do their jobs for them, or clean up their messes. Here, servitude means that leaders work on behalf of the people they lead, serving the best interests of the individuals, team, customers, and organization. Through training, guidance, and the continuity of vision and direction they provide, humble leaders constantly strive to better others. Humble leaders do not need to seek the spotlight of recognition. In fact, no competent leader is anxious to impress people with his or her performance credentials. Their success is defined not by being indispensable to the organization, but by leading others to lead themselves to self-sufficiency. Remember, the most effective leader is one who makes his own presence unnecessary. Rather than seek personal recognition for the goals they accomplish, they make the success of others their path to personal achievement. Humans are imperfect creatures, and there is nothing superhuman about superior leaders. All are fallible, but as with most failings, it is the manner in which the shortfall is handled that sets effective leaders apart. Leaders who forget or ignore their own weaknesses will inevitably fail. Strong leaders are definite and decisive, but not inflexible. They acknowledge and own the mistakes they make. They do not perpetuate bad decisions out of ego or fear, but adapt to changing circumstances and know when to change their mind. Character and trust is strengthened when leaders admit and take ownership of mistakes. Humble leaders acknowledge and understand their limitations, and are vigilant in their efforts to mitigate their shortcomings. Rather than feel threatened, they surround themselves with others whose skill sets compliment their own areas of weakness. Keeping their egos in check, they put the strength and success of the team ahead of any desire for the personal spotlight. Finally, leaders who understand the importance of humility do not abuse their authority. In fact, they understand the difference between having authority and being authoritative. To reuse an analogy, authority is like a sword. Those who are authoritative swing it indiscriminately, either to reinforce their position of power or out of simple ignorance and inexperience. The recently promoted have a dangerous tendency to let their newly bestowed title go straight to their heads. They wield their title like a sword, without first establishing credibility and trust. These managers have not yet figured out that there is no correlation between title and authority beyond the implied presumption of power. Like trust and respect, true authority is earned, not bestowed. Without it, the power of influence is superficial and stifled. David Packard, the co-founder of Hewlett-Packard, exemplified humility in his leadership and management of his company. A man who avoided publicity, Packard is quoted as saying: “You shouldn’t gloat about anything you’ve done; you ought to keep going and find something better to do.” Superior leaders, like Dave Packard, are humble, with a willingness to serve others first. They embrace their weaknesses, and admit mistakes. As I wrote in my last post, personal discipline, as it contributes to strength of character, ensures we are guided by principle rather than emotion or personal desire. In that context, self-discipline, resilience, and integrity all go hand in hand. But in a much broader sense, the discipline that strong leaders demonstrate reflects much more than mere self-control. Disciplined leaders must be able to consistently make decisions that are clear-headed, informed, and conclusive. Their response to difficult and stressful situations is thoughtful and purposeful, never random or subjective, particularly in emotionally charged situations. Objectives are communicated clearly and unambiguously. This is not always an easy thing to do, which is why this attribute has such a profound impact on those around us. To borrow (and modify) a quote from the world of sports… “Adversity doesn’t build character, it reveals it.” A firm, definite, and decisive leader demonstrates grace under pressure, very clearly reinforcing the perception that he or she is in complete control (of both the situation and his/her own emotions). While disciplined leaders are decisive, they must at the same time exercise sound judgment. I read somewhere that judgment is the application of wisdom. Emotions run high in times of crisis. Most people intuitively look for someone to “do something” in emergencies or uncomfortable situations. It often requires great discipline to think before responding. As Jimi Hendrix is famously quoted, “Knowledge speaks, wisdom listens.” Any situation that requires action, whether it is crisis, conflict, or moral failure (of self or others) necessitates a thoughtful and measured response from a leader. Knowledge and experience are necessary, even crucial. But like a sword, they are only as effective as the person wielding them. Drawing on a distinction that will be further explored in a later post, leaders can and should be flexible when appropriate. However, it is one thing to compromise on matters of preference, it is another to compromise on matters of principle. Strong, disciplined leaders understand this difference and are of unwavering conviction. Unfortunately, in a world where the boundaries of morality and foundation of ethics are deemed malleable and subject to individual interpretation (so as not to offend one group or another), any semblance of absolute “right” and “wrong” is obscured. Right and wrong become a matter of convenience and opinion, lacking any moral or ethical bearing or even anything close to consensus. It takes courage to draw a line in the sand, to stand up for what you believe in. Some consider this to be close-minded or prejudicial, even intolerant. One thing is for sure. Those in positions of influence weaken themselves as leaders whenever they compromise their principles. Whether in work groups or politics, it is rare to find everyone in agreement, and even the strongest leaders can and should be questioned and appropriately challenged. Values vary and people come to different conclusions and form different beliefs. It requires strength of conviction and great discipline to stay the course. Fortunately, faith and trust are more important than belief. People are far more willing to follow a disciplined leader they trust, particularly when they disagree. However, no one will follow a leader they don’t trust or in whom they have no faith – leaders who fail to be true to themselves and the principles on which they claim to stand. It is important to remember that as leaders, we are also tasked with teaching. It is quite common for managers to want to maintain personal control over every responsibility they are tasked to accomplish. Our desire for perfection and to be needed often gets in the way of the greater goal we seek. After all, even as children we’re taught, “If you want something done right you have to do it yourself.” But as I said earlier, people need room to fail as well as succeed. Superior leaders keep this bigger picture in mind, and delegate what doesn’t absolutely require their personal attention. It is not an easy thing to do. Most leaders have achieved their position by “doing.” It takes courage to give up some of that control. It takes discipline and a sense of humble acknowledgment that only through the achievement of those we lead will we as leaders truly become successful. Strength of character, as the blog title implies, is one of the most important attributes of a leader. As I stated earlier, effective leaders must have credibility, the trust and confidence of others. Key to this is a strong sense of integrity. Integrity is built on honesty and the consistent, steadfast adherence to established principles and standards. Strong leadership is dependent upon character, and character is certainly measured, if not defined, by integrity. Perhaps the greatest risk to the integrity of a leader is temptation. In the eyes of employees, team members, students, constituents, and even family members, leaders are held to a higher ethical standard. Leaders are expected to conduct themselves in a manner that is measured and fair and beyond reproach. Of course, the reality is that leaders are fallible humans, subject to the same temptations, distractions, and vices as everyone else. But the perception and expectation that leaders will act in the best interest of others persists nonetheless. For this reason, a strong sense of personal self discipline is critical. Self discipline ensures we act and make decisions based on principle rather than emotion or personal desire. This is one area where our political leaders and our political system tend to fail us. Isn’t it ironic that the entire political establishment of our country spends so much time and effort working to sustain its competition for power? If democrats and republicans spent as much time working together for the good of the country as they do working to keep their respective parties in power, imagine what could be accomplished. And this holds true not only at the party level, but even more egregiously at the individual level. We are bombarded on virtually a daily basis with headlines that expose fraud, corruption, and abuse of power on some level. It would be bad enough if these transgressions were conducted for the benefit of a given state or locale, but they invariably serve the interests of the indicted individual and his or her cronies. Political posturing at the party level is no better. Legislative actions are routinely road blocked for no other reason than they’re being championed by someone on the other side of the isle. Worse, many bills are bought and paid for by private interest groups. You can call me naive all you want. It’s all about one hand greasing the other. It’s all about maintaining power, maintaining control. Serving the country is not always first on the agenda. Unfortunately, although manifested differently, these same character flaws are often revealed in business as well, where organizational integrity takes a back seat to revenue and profits. Company executives line their pockets at the expense of investors and employees, executive pay is outrageously out of scale with performance, perks extravagant and fiscally irresponsible. Accounting fraud, consumer deception, defective and dangerous products – all commonplace and all profitable. Even within the day to day operation of the business, the politics of power and influence drive many of the decisions that are made, policies that are introduced, even promotions that take place. It’s quite a chess game, the posturing and positioning, and always with the underlying design to sustain or grow someone’s position of power and influence. Now, I admit that I’m painting a dire and pessimistic picture. Certainly not all leaders are like this, in politics or business. But the fact is that what I’ve described takes place every day in our world – not just in “the” world, but in “our” world. The lack of integrity we experience in our leaders is extremely destructive to our faith in their ability to effectively lead. Whether a boss, an elected official, or an entire company or industry, their character is called into question every day, either headlined on the nightly news for all the world to see, or quietly whispered between co-workers around the water fountain. Unfortunately, the effect of it all is a greatly diminished sense of trust in our leaders at every level of society. And without our trust, how long will we continue to follow their lead? After all, trust is a product of character and integrity, and part of the foundation on which effective leadership is built. If character is built upon a foundation of integrity, discipline, and trust, it’s then framed with resilience and covered in unwavering conviction and confidence. While having many weaknesses and limitations, leaders must be strong and undaunted. However, do not confuse voice of confidence with voice of arrogance. Ego, pride, and an inflated sense of self-importance all breed arrogance. How many times have we answered a daughter or son’s “Why?” with, “Because I said so!” As a parent I can personally relate to that, but it is a great example of a response based on title/position instead of conviction. If a decision is based on objective criteria, would not a better response be a confident explanation designed to educate and foster trust? Strong leaders do not communicate from a perspective of position or title. They don’t have to. Quite the contrary, their voice of authority comes from the strength of conviction of right and wrong, not strength of ego. It’s a subtle distinction, but one that is extraordinarily important. Finally, strength of character cannot be complete without sensitivity to the needs of others. Empathy is essential to compassion, sensitivity, and understanding. Leaders must be willing to give people room to fail as well as succeed. Everyone needs encouragement and reinforcement when they struggle. That’s why we coach. Those strong of character do not delight in the failure of others, they are burdened by it. However, the real distinction is that they feel compelled to help.